A dental implant is a titanium post that is inserted into your jaw to function as a replacement root for a missing tooth. 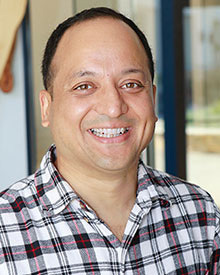 Dr. Khetani uses implants to support an individual dental crown to replace a single missing tooth, or a dental bridge to replace several missing teeth in a row. Dental implants are the strongest, most lifelike and longest-lasting tooth replacement option, and they can last a lifetime with proper care. Dental implants are also the only form of tooth replacement that prevents bone loss in the jaw. 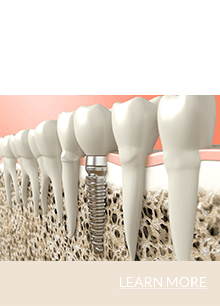 Dr. Khetani will listen to your needs and help you determine if dental implants are the right solution for you. Dr. Khetani will conduct a comprehensive examination which includes digital X-rays and an analysis of the bone levels in your jaw. She will review your medical and dental history and obtain any additional information needed to determine if you are a candidate for implants. A trusted local specialist will then place your implants, and Dr. Khetani will work in tight coordination with them to ensure all goes smoothly for you. Dr. Khetani will design and fabricate your new teeth with meticulous attention to detail, using high-quality materials that are strong and have a completely natural appearance. She will provide you with temporary cosmetic teeth to preserve your smile while your implants heal, and will work closely with you to ensure you are completely satisfied with your permanent replacement teeth. A single missing tooth can be replaced by an implant topped with a porcelain crown. To replace two or more missing teeth in a row, Dr. Khetani can provide a durable and aesthetic porcelain bridge that is supported by two implants on either side. 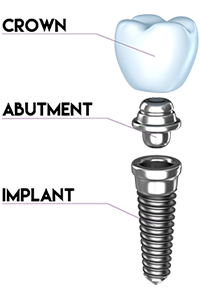 Dental implants have numerous advantages which make them the most optimum form of tooth replacement. Chewing with implant-supported teeth creates the pressure on your jaw that needed to preserve its volume and density, whereas other types of tooth replacement do not. Implants are as strong as natural tooth roots and give your replacement teeth the same chewing power as natural teeth. Implant-supported individual teeth and dental bridges also keep the adjacent teeth stably in position so they do not drift and cause problems with your bite alignment or ability to chew. In the past, people with too much bone loss in their jaws, and people with non-optimum health issues such as diabetes, cardiovascular disease and smoking, were not eligible for dental implants. 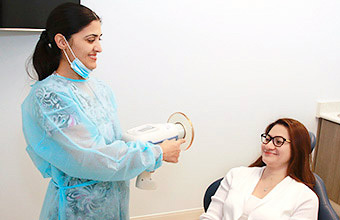 But major advances in bone grafting, diagnostics and placement techniques have made it possible for almost anyone to receive implants safely. People of any age can receive dental implants, the only exception being young persons whose jaws have not fully developed. 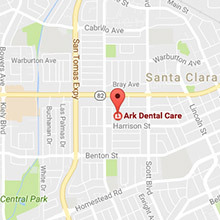 Dr. Khetani can examine you and let you know if dental implants are an option for you.